Speed of data acquisition, together with bleed levels and inertness, are at the heart of innovations in the gas chromatography market. Sean Ottewell investigates. Bruker has released its new generation gas chromatograph platform - the SCION series gas chromatographs. Utilising the Innovation with Purpose strategy, Bruker says the SCION 436-GC and SCION 456-GC set a new standard for data acquisition speed - at greater than 600Hz per channel. This key advance increases productivity and provides a platform that will inspire further advancement of GC separation technology, adds the company. Every SCION GC series comes standard with a nine-inch, multi-language touch-panel designed for full GC operation in 13 different languages, making it truly a global instrument. Frank Laukien, president and ceo of Bruker Corporation, commented, "The launch of the new generation SCION 436 and 456 gas chromatographs reaffirms our commitment to providing innovative new products to the gas chromatography market. Continuing from the incredibly successful SCION TQ and SQ products, the new SCION GCs set the stage for even more innovations from Bruker in this key market segment." The SCION 436-GC is a compact two injectors, two detectors, platform that supports all the injectors and detectors including mass spectrometry - a perfect choice when bench space is at a premium. The SCION 456-GC provides industry-leading flexibility by supporting three injectors and four detectors, including the mass spectrometer. Meredith Conoley, director of GC marketing, added, "The SCION 456-GC is the industry's first system to be able to simultaneously acquire data from four detectors including a mass spectrometer, providing our users a rapid time-to-benefit advantage." Also new to the market is GE Healthcare's ÄKTA pure, a chromatography system for flexible, reliable and intuitive purification of proteins. ÄKTA pure, the latest addition to the ÄKTA range of chromatography systems, is an easy-to-use modular system that offers the flexibility to support both routine and challenging purification requirements, as well as being adaptable to changing research needs. Johan von Heijne, head of research products, GE Healthcare Life Sciences, said: "In an increasingly challenging research environment, where needs and priorities can change rapidly, researchers want to know that the protein purification system they purchase has longevity. By taking a modular approach with ÄKTA pure, we are providing a system that not only simplifies researchers' work but also gives them a flexible option for expanding and tailoring their purification capabilities as their research progresses. There is simply an ÄKTA pure for everyone." In today's research environment, scientists are often expected to undertake all aspects of the protein discovery workflow, from genomics through to purification and characterisation, and the requirement to isolate specific proteins at high purity in short timelines often means that chromatography conditions and methodologies have become more challenging. ÄKTA pure is specifically designed to enable researchers - from beginners to experts - to easily isolate their target protein, whether under simple or complex conditions. ÄKTA pure eliminates the need for programming skills to control the chromatography run, with the addition of simple drag-and-drop method templates in the UNICORN 6 control software. Through the software it is also possible to electronically track the use of, and data obtained from, individual columns, which is particularly useful as chromatography systems are often placed in shared facilities. Agilent Technologies has launched a series of new J&W gas chromatography columns designed for environmental and pharmaceutical applications. The new additions expand the Agilent J&W family of columns, three of which are ultra inert GC solutions. "Agilent J&W GC columns offer the lowest bleed levels, the best inertness for acids/bases/mixed-function compounds, and the tightest column-to-column reproducibility," said Anne Jones, general manager, Agilent Chemistries Division. "Every Agilent J&W Ultra Inert GC column is tested with the most demanding ultra inert test-probe mixture in the industry, and an individual performance summary sheet is shipped with each column." Agilent J&W DB-UI 8270D Ultra Inert GC columns deliver excellent peak-shape performance for active semi-volatile organic compounds targeted by US Environmental Protection Agency method 8270D, so researchers can perform the most challenging environmental trace-level analyses with the utmost confidence. The columns are optimised for fast analysis of volatile compounds, and are ideal for environmental and chemical samples with unknown components. They deliver the highest degree of column inertness for improved peak shape and linearity for the environmental industry. 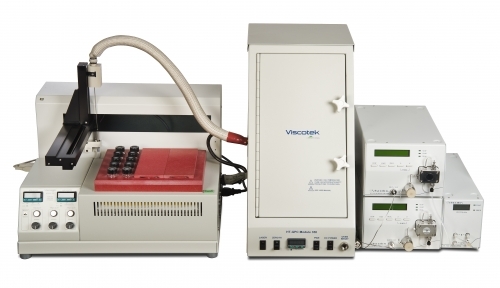 Meanwhile Viscotek is the new high temperature gel permeation chromatograph (HT-GPC) from Malvern Instruments. It is a powerful, fully automated, multi-detector system designed to prepare and analyse polymers, such as polyethylene and polypropylene that demand temperatures as high as 160°C in order to dissolve for successful analysis. Capable of generating molecular weight, molecular weight distribution and structural information in a single experiment, the HT-GPC produces an information-rich data stream for intelligent polymer engineering (Fig.1). Molecular weight and distribution are defining characteristics of polymers, but structure such as the extent of chain branching is also critical. In developing new products, researchers tune vital properties such as strength, processability, flexibility and permeability, by manipulating the extent of branching as well as the molecular weight and distribution. GPC is relied on to provide much of the necessary analytical information. The full Viscotek HT-GPC triple detector configuration includes refractive index (RI), viscometry and low angle light scattering (LALS) detection. Together these detectors provide absolute molecular weight without extrapolation or correction, molecular size, intrinsic viscosity and branching information, from a single experiment. Advanced OmniSEC software drives analysis with full polymer branching calculations capability and an intuitive Branching View function that simplifies the study of long chain branching. Phenomenex, a global leader in the research and manufacture of advanced technologies for the separation sciences, has extended its successful Lux chiral media line to meet the needs of preparative chromatography applications. Lux Cellulose-1 and -2, novel and complementary chiral stationary phases, are now available in 10-micron particle size for batch preparative chromatography. According to the company, Lux Cellulose-1 is one of the most successful chiral stationary phases on the market today. The two cellulose-based phases add to a dependable, high-resolution screening set with a wide range of selectivity. The new 10-micron particles are available both in Axia-packed preparative columns, and in bulk, enabling customers to pack their own columns for the most cost-effective purification methods. Lux chiral phases Cellulose-1, -2, -3 and -4 are already offered in 20-micron bulk media for use in batch preparative and simulated moving bed chromatography. Packing columns with new 10-micron particles delivers increased efficiencies by enabling the use of shorter columns without compromising results. This saves time and reduces solvent consumption. Lux Cellulose phases benefit from Phenomenex's novel manufacturing process and silica coating technology. Lux Cellulose-1 uses cellulose tris (3, 5-dimethylphenylcarbamate) as the chiral selector. Lux Cellulose-2 provides a second chiral selector, cellulose tris (3-chloro-4-methylphenylcarbamate), providing a unique chlorinated stationary phase with complementary selectivity to Lux Cellulose-1. "The demand for chiral preparative separations continues to grow in pharmaceutical R&D, as well as in toxicology studies," explains Marc Jacob, product manager for Phenomenex. "Our Lux media have been very successful in resolving and identifying enantiomers and we are pleased to expand our offering to meet the needs of preparative chromatography applications." Phenomenex has also introduced Yarra, a new family of aqueous size exclusion chromatography (SEC) columns for biomolecule analysis. With years of R&D behind the product technology, Yarra columns are engineered to provide efficiency increases of up to 70 per cent and much higher resolving power than other media. Yarra columns, offered in three phases with three-micron particles, are ideal for the separation of small to large proteins and peptides, as well as biological therapeutics and biosimilars. Phenomenex proprietary hydrophilic surface chemistry ensures high resolution and minimal absorption of proteins for accurate quantitation. Kieran Curley of US company Mannkind Corporation is one of the early users of Yarra. "I was very impressed with the Yarra SEC-3000 300 x 7.8mm column. It provided excellent resolution between the monomer and HMWP peaks, which allowed for consistent integration. The peak shape was greatly improved for all sample components. We immediately revised our test method to include the Yarra SEC-3000 column," he said. Thermo Fisher Scientific offers a range of novel and innovative gas chromatography (GC) columns to meet the changing and challenging needs of today's analyses in markets such as environmental, food safety, petrochemical and forensics. However, the company describes its new TraceGOLD columns as a leap forward in GC column technology, offering guaranteed performance. In particular, users benefit from ultra-low bleed, superior inertness and excellent reproducibility. The company has also officially opened its molecular biology centre of excellence in Vilnius, Lithuania. The Vilnius site will showcase world-class capabilities for developing and manufacturing products used in a range of life sciences applications. For example, it provides innovative technologies for PCR-based (polymerase chain reaction) testing, nucleic acid sample preparation protein purification and antibodies for ELISA (enzyme-linked immunosorbent assay) testing. "Our expanded R&D and manufacturing presence in Vilnius strengthens our ability to serve the growing biotechnology community in Eastern Europe, particularly our research customers who rely on innovations in molecular biology to accelerate developments in diagnosing and treating disease," said Marc N Casper, president and ceo of Thermo Fisher Scientific. "We now have a solid foundation from which we can continue to increase our depth of capabilities for high-growth life sciences markets in the region, from PCR-based products to our broader biosciences portfolio." The 156,000 ft2 molecular biology centre of excellence is currently home to more than 400 research, laboratory and manufacturing personnel, with room for expansion. In addition to its geographically central location, Lithuania is known for its well-established commitment to innovation, highly skilled life sciences workforce and favourable economic environment.